The greatest strife over boundaries was to come two and a half centuries later. Lying between Sandridge and Wheathampstead, a mile north of Sandridge church, is an uncultivated area, known as Nomansland. Such lands were usually dedicated to the devil, and it was considered dangerous to break them up by means of cultivation1. This common lay between the domain of the Abbey of St Albans, namely Sandridge on the south, and that of Westminster Abbey on the north. Both abbots claimed it, although its name implies that it was extra-parochial, and it was a source of frequent disputes between them. The right to erect gallows was one eagerly sought for, and firmly held, not because people particularly wanted to hang one another, but because the erection of the gallows established in time rightful ownership. About the year 1417 Richard Wyth, bailiff of the Abbot of Westminster, erected a gallows on Nomansland to the injury of the manor of Sandridge and the Abbey of St Albans. The gallows stood there unmolested for ten years as an indication of the ownership of Westminster. The year following the gallows were hewn down by swords and axes, no one knowing by whom, or so, at least, the chronicler says. Immediately John Wyth, the bailiff of Westminster, re-erected them, and the abbot of St Albans, having taken legal advice, had them pulled down once more. In this his servants and tenants were assisted by some Wheathampstead folk who happened to be passing. But the parishioners of Wheathampstead apparently had misgivings as to their imprudence in supporting St Albans against their own overlord. 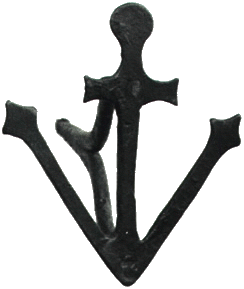 When Rogation-tide, the recognised time of beating parish boundaries, was upon them, they at about seven o'clock in the morning "In fear of their skins", stealthily made perambulation of the disputed territory, leaving as a sign of their activities a small piece of wood fashioned as a cross lying on the ground. The next day the abbot of St Albans, considering this a piece of sharp practice by the Wheathampstead folk, sent out his own servants to reconnoitre; they returned reporting that they had seen no one except a few fellows lurking behind hedges, and had met with no opposition. 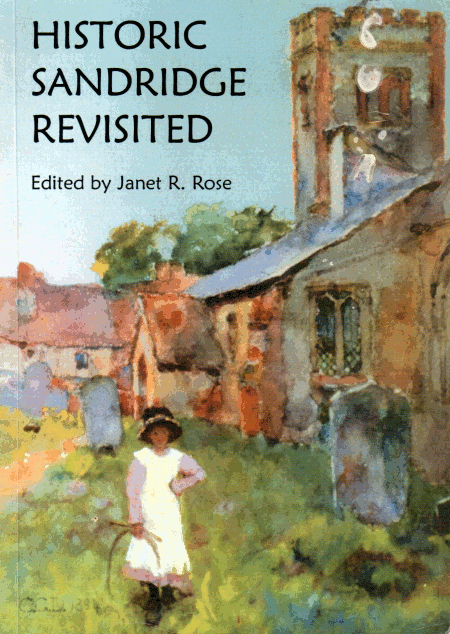 Whereupon Sandridge led by the vicar, beat the bounds properly, according to their claims. They sang hymns as they went, and chanted the Gospel of the day and returned unmolested. In July 1428 a shepherd of Wheathampstedbury died suddenly on Nomansland while lending his sheep. The vicar of Sandridge claimed the body for burial on the grounds that the soil belonged to the abbot of St Albans. But the people of Wheathampstead seized the body, bore it to their church and buried it in that churchyard even while litigation was pending between the two abbots, the body having had no inquest held over it by the coroner. The next year an understanding was reached John Fray, Baron of the Royal Exchequer, with the clerk of the cellarer, made a tour of the boundaries; on the following day at about three hours before supper there was an assembly of the steward of St Albans Abbey, a lawyer of St Albans living at Sopwell and general adviser to the Abbey, the abbey cook, the bailiff of the abbot of Westminster and also the steward, and several tenants of both parties. A description of the bounds was read according to the evidences of Westminster, and John Adam, "an exceedingly old man far advanced in years" bore witness that the said heath was common land of both parties and not of one only. If the land in question was in fact common to both abbeys, one would assume that neither would claim the right to erect gallows upon it, but sooner or later the Abbot of Westminster had the audacity to erect another gallows upon Nomansland. These were promptly cut down by Robert Belamy, a Sandridge farmer, and Matthew Bepsette, a domestic servant of the abbot of St Albans. The two men also carted away the materials. This took place on 14th November 1434, and the dispute arising therefrom lasted nearly six years. An attempt to settle it by arbitration proved fruitless, because neither abbot would yield his claims. The Abbot of St Albans put the blame, if any, for the destruction of the first gallows on a notorious robber called William Wawe. The other gallows he had removed because they were on his land. The Abbot of Westminster said that they were on his land, and complained that the Sandridge men had forced an innocent Wheathampstead man called John Plomer to assist them in their dirty work by threats of mutilation and death. Princess Elizabeth thanked the Thrale family for hiding and securing her escape at Nomansland from Queen Mary between 1556 and 1558. When Elizabeth became Queen she repaid the Thrale family by giving them the family arms and a broad arrow. It is though that the first Thrale to hold Nomansland was Ralph Thrale (1565-1648). From this Ralph, Nomansland was held by a Ralph Thrale for seven generations. As is often the case, it seems that this family legend may not quite be accurate. 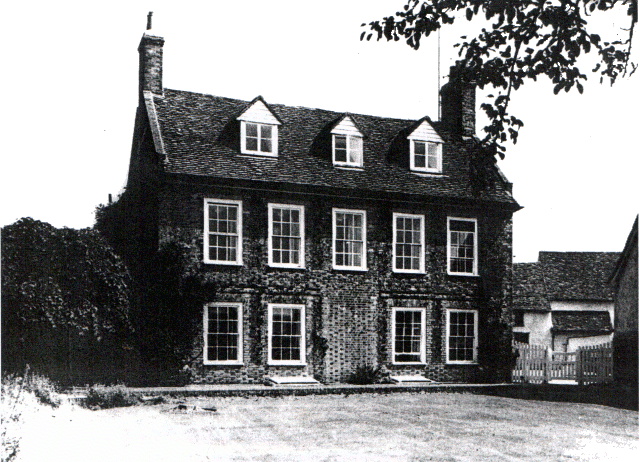 After the Dissolution of the Monasteries there was conflict with the Rowlatt family who then owned the Manor of Sandridge. The Thrales had obtained a 40 year Lease on Sandridgebury from the Monastery and were still there in 1542, though the Lessor's deeds were lost. Many Thrale family artefacts were inherited by the Mardall family of Wheathampstead through the marriage of the sister of the last two Thrale bachelor brothers who farmed at Nomansland up to their death in 1883. During 2005, Thrale.com was contacted by Richard Herbert who was trying to write his company's history. 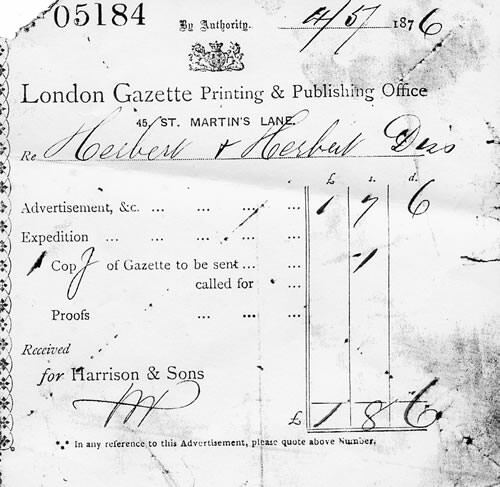 During his research, he found a newspaper clipping about an outing to No Man's Land on Saturday July 9th 1870, arranged by his great-great-grandfather. Richard contacted me to ask if I had any records of such visits. Were they regular, or was this a special one? He also asked about the King William Inn, which he could not trace. I was fascinated to read the article that he kindly sent me, which is reproduced below, together with a contemporary receipt from the publishers. Messrs. Herbert and Sons, scale-makers and gas fitters, of St. George-street, E., King's Cross, and 7, West Smithfield, E.C., gave their annual treat to the workmen in their employ on Saturday last. The spot this year selected was King William inn, No Man's Land, about five miles beyond St Albans, a charmingly rural location, and which to London denizens must have presented the most perfect realization of 'fresh fields and pastures new,' which the jaded mind sighs after. The journey was, it is needless to say, an unusually long one to travel by road. The start was made by private Omnibus, with four horses, from King's Cross, a little before nine o'clock, and 'No Man's Land' was not reached until half-past one. Dinner was immediately partaken of, with appetites sharpened by the drive, and was supplied, in a manner that gave the most perfect satisfaction, by Mr. T. Archer, the landlord of the 'King-William.' Mr. Herbert occupied the chair, and Mr. George Herbert the vice-chair. 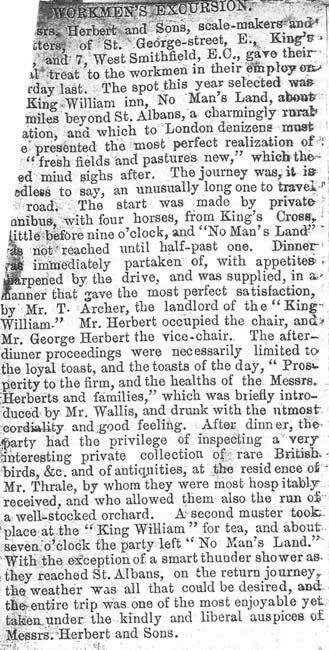 The after-dinner proceedings were necessarily limited to the loyal toast, and the toasts of the day, 'Prosperity to the firm, and the healths of the Messrs. Herberts and families,' which was briefly introduced by Mr. Wallis, and drunk with the utmost cordiality and good feeling. After dinner, the party had the privilege of inspecting a 'very interesting private collection of rare British birds, &c. and of antiquities, at the residence of Mr. Thrale, by whom they were most hospitably received, and who allowed them also the run of a well-stocked orchard. A second muster took place at the 'King William' for tea, and about seven o'clock the party left 'No Man's Land.' With the exception of a smart thunder shower as they reached St Albans, on the return journey, the weather was all that could be desired, and the entire trip was one of the most enjoyable yet taken under the kindly and liberal auspices of Messrs. Herbert and Sons. I am pleased that I was able to assist Richard by telling him that the curators were brothers Ralph and Norman Thrale who were my first cousins, five time removed. was unable to say if such visits were regular - I guess they were occasional - it was a museum. The company's record of the excursion is here. I lived at Nomansland Farm as a child. And remember seeing the original deeds of the house, mentioning the Thrale family as owners or lessees (or is it lessors) I cannot remember which. These were written on parchment. There was a lot of other information regarding ages, births and deaths in these documents. Apparently, for a while Nomansland farm had been an Inn or Public House which was called 'The Sign of the White Horse'. I also remember that the farm was sold by the Thrale family to a family called Edwards, which was mentioned in later deeds. Certainly when we moved in, there was an old lady, Mrs Edwards and about 25 cats in the farmhouse. That is assuming that the farm was sold and was not just taken on by the Edwards family … I cannot remember the wording on the deeds … that is one possibility. Although I doubt that the farm would have been able to have been sold on, by someone who had just leased it, unless the Edwards family had been in residence for enough years to have gained ownership rights! The farm was sold3 to an sheep research facility of which my step father was a director or manager. Which is how we came to live in the house. I never saw any of the documents after we moved from Nomansland. I always wondered where these documents went. I assume that they would have been handed over to the solicitors dealing with the next sale - and they should have been handed over to the new owners. If not, they may have been passed on to my step-fathers family - the Leiper family. Of whom I have no contact with. It may be worth researching this further. I am sure that they would pass on any information if they have it. I cannot believe that they would have just been lost. Someone knows something. Nomansland farm was sold to another local family, much was made of this in a newspaper article, which annoyed us slightly as we had been local people too! I seem to remember that my step father had an interest in Hill End farm and that my uncle and ex-cavalry man owned a farm and riding school at the other end of Nomansland Common. It was certainly a lovely place for a child to live. I believe a member of the Thrale family4 had strong hunting connections, and that the hounds were kept at Nomansland, the orchard was called Dog Kennel Orchard, which everyone locally knew about. I found many bones of large animals in the orchard, to say nothing of the odd gravestone! Probably animal gravestones … maybe! I always thought that there was a hidden underground tunnel running through various parts of Nomansland farm. In particular by the old windmill , behind the old stables, the ground sounded hollow when walked over. Judging by the sound, I would say it was a rather large tunnel. I was told that it was probably a highwayman's escape tunnel … they had been particularly active in that area. It still annoys me that we never looked into it further! Although Thrale.com says that they were probably refuse tips. All I can say is that they must have been big ones! There was also a secret room which my step brother and I discovered behind the water tank in one of the attic rooms, although we were probably not the first to find it, it was strange. I am glad that you found my ramblings interesting. Fortunately I type very quickly. Unfortunately I may repeat myself! I will look out some photos. I know I have a few somewhere! I lived at the farm from about 1965 until 1969 or 1970. Have you been to Nomansland? We actually had a sneak visit a few months ago, when visiting family nearby. It looks much the same. It cannot really be seen by the road hence we just had to turn the car around in the yard. Both exterior and interior were typical Queen Anne style, window shutters, oak panelling, interesting attics. Three storeys plus the cellar. The cellar, which could be reached from inside the house or outside was pretty large. I bet there was a secret passageway that had been bricked off. The entrance from inside the house was between the kitchen and the stairs and I think had the original oak panelled door, I remember it was quite narrow. I'll have to find a moment to write out a quick floor plan for you, although it wouldn't be to scale, it is probably the best way to describe it, I think! Downstairs. From right to left starting at the front door which incidentally was at the side of the house! Porch, with wisteria, dining room, sitting room, office room, stairs leading up to first landing entrance to cellar, kitchen and downstairs loo! Landing 1 from right to left, bedroom 1 (my room), bathroom, stairs to attic, bedroom 2 , bedroom 3, bedroom 4. There was one long and fairly large attic room which had two windows (with the water tank and secret room) and a smaller room, plus a large space containing further water tanks and spiders! In fact spider-wise, I remember in the sitting room. It was wise to sit on a chair or the sofa, the floor could be dodgy! You could hear the spiders walking across the floorboards to the carpet, which was the sign to lift ones feet from the floor - to stop them climbing up your leg! Said spider would invariably emerge from under the sofa and usually walk with a nonchalant swagger across the floor. I mean they were BIG, fortunately none of us were scared of them. But they had a nasty habit of walking across the bedroom ceilings and dropping in our beds! This could be unnerving. For years I kept the habit of checking the bed for spiders before getting in! It was worse though when they dropped in when one was asleep, waking up with an accidentally squashed spider is not pleasant. We actually had a spider expert, come and identify them. Apparently they were the common spider but due to centuries of undisturbed breeding and living in the cellars and attics they had become uncommonly HUGE! There was a large building close to the house which looked extremely old, lots of rafters and same colour bricks as the house, I think it had remnants of stalls in it, but certainly lots of old farm machinery, various later buildings had been attached on to it at later dates. Opposite that building, were some old stables, probably the same age as the house. As the yard buildings went further from the house, the buildings decreased in age. There was a very old summer house in the garden, which was on a turntable! I remember an old wall which surrounded the vegetable garden - same colour bricks as the house - which looked fairly old. The garden was fairly large, with an arbour which had an old red brick path leading up to it. A particularly large copper beech at the end of the garden, which my step-brothers climbed up and which seemed a long way to fall from. I declined! There was a very tall elm tree which I think got struck by lightning, or it succumbed to the wind and disease. Which narrowly missed the house when it fell, had it been any taller! Apart from that there was mauve wisteria at the front door growing in the porch (they can live for years), laburnum trees, two lilac trees by the summerhouse. Thinking about it they must have been planted when the summerhouse was put there. The summerhouse was blue and white as were the lilac trees. The garden had a hedge separating it from Dog Kennel Orchard. I'm not sure what was farmed before, I think sheep figured fairly prominently. But I don't really know. Re the Leiper family, I unfortunately lost track of my step-brothers when my mother and their father divorced. Which is a bit sad. The family had roots in Scotland. Have you tried contacting the present owners of Nomansland? Good luck in your quest. When I have more time, I will send some photos. With the enclosure of land in the 17th century, Nomansland, although privately owned by the Lord of The Manor, remained a Common. The people had the right to graze animals, cut wood, and use many of the natural resources of the land. In the early 18th century clay and chalk were dug for brick-making, and it is known brick kilns were working there in 1759. Gravel was also extracted for building and road repair. Many of the resultant pits were used as refuse tips in Victorian times. Some Victorian artefacts, particularly bottles, have been found there in recent times. The Common, mostly in the parish, was used for cricket, prize fighting and racing between 1824 and 1855. Watford beat Hertfordshire by 104 runs in a cricket match in August 1824. In 1829 a race meeting promoted by Thomas Coleman, a well-known trainer of horses, who lived at the Chequers Inn, St Albans was held. The King's horse, Hindustan, won the Gorhambury Stakes but the meeting was not a financial success. A two-day steeplechase meeting was held in the middle of May 1833 (some say that it was the first, but it is thought they originated in Ireland). From 1838 racing was held at Gorgambury. In 1879 a travelling circus performed on the common, and subsequently there was an annual visit well into the twentieth century; plus a Sandridge Fair. The Hunt met on the 23rd November 1892 at Sandridge. At the end of May 1833 a dreadful fist fight took place in which James 'Deaf' Burke knocked out Simon Byrne, the champion of Ireland, in the ninety-ninth round. They were fighting for 3 hours 16 minutes. Mr Byrne died four days later, so Mr Burke and his seconds were tried for manslaughter. They avoided any penalty as it could not be proved that death was caused by the injuries sustained in the fight! During World War II the devil was ignored and a large area was ploughed up for sowing potatoes for about three years. A quantity of lime was used for this purpose which somewhat altered the make-up of the land and flora, areas of which are reverting to scrub. The southern area is the only area in the parish still owned by Lord Spencer in the late twentieth century, and is let to the District Council for recreational use. It is run by a management committee consisting of members of Sandridge and Wheathampstead Parish Councils. It is a registered common. Nomansland was registered in 1968 under the Commons Registration legislation, and in 1970 Nomansland was designated a Country Park. Thomas Thrale of Hammonds died in 1637, and the farm was taken over by his son Thomas. William Thrale was a Poor Law guardian and farmed Nomansland, and another Richard Thrale farmed Sandridgebury. When Richard's daughter Rose5 of Watford died in 1653, her body was brought back to Sandridge for burial under the floor of the chancel, just west of the altar rails, though her memorial has long since disappeared. 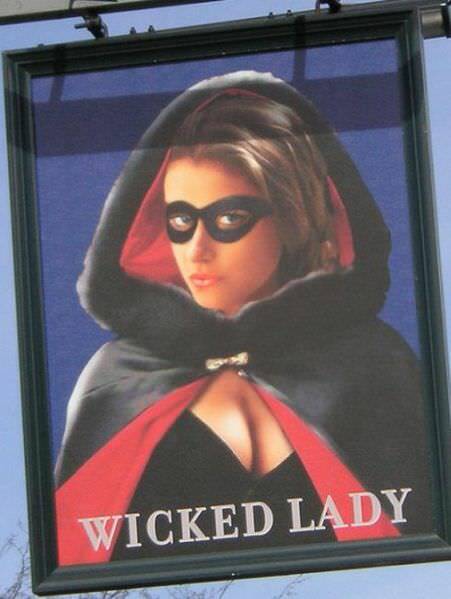 The King William inn, was later renamed The Park Hotel, and later renamed in 1970 The Wicked Lady. It still trades as a pub / restaurant called The Wicked Lady after 'Wicked' Lady Katherine Ferrers of Markyate (1634-1660) who took to highway robbery and reputedly received fatal wounds at Nomansland. 1. G.L.Gomme, The Village Community, p.115. 2. Registrum Abbatiae, Johannis Whethamstede 1451-1464. pp.6,14,15,24,35. Registrum Abbatiae, Willelmi Alban 1465-1472. pp.127-143,213-220. From what I remember as a child Nomansland was a common land between Wheathampstead and St. Albans, with Harpenden to the ?north of it, we played there as children and my father learnt to drive on it! As common land it was owned by no one person, it was the property of the people, used to graze their live stock on. It is about 3 or 4 miles from Thrale's End and I pass Thrale's End Land daily to visit my mother in Harpenden, the farm Thrales End Farm I think backs onto Luton Hoo land and I believe that it is no longer in the Thrale family and when my oldest friend returns from her holiday I shall ask her if this was the farm that members of her extended family farmed. Valerie Winwood-Thrale, wife of Nigel Thrale of Leagrave Luton Bedfordshire. Did you ever get a chance to speak to your friend about Nomansland? Ever since I can remember there was some talk of Nomansland being owned by the Thrale's but that no-one can prove it. Have you or your friend heard this one? Do you know who occuppies / owns Thrale's End Farm? Is it a Thrale? I came to your rather amazing family website after a search on Nomansland, Wheathampstead. A quick background, I became interested in Nomansland after I found that one of my own ancestors - Charles Thompson, was listed on his birth certificate as having been born there in 1865 (parents William John Thompson and Mary nee Trevethick). I'm not sure when the family moved to Nomansland, although it was sometime after 1862 (their previous child was born at Halliloo Farm in Chelsham, Surrey). They then moved to London sometime between October 1865 and April 1866, and then on to Australia sometime around 1874. I realise that its probably a long-shot, but I was wondering if perhaps you might have any information regarding Nomansland for this period or even if you might have some suggestions for how I might go about finding such information? Forgive the naivety of my questions, I'm fairly new to genealogy and being from Australia, even newer to English genealogy! Until I found your website I hadn't even realised that there was Nomansland, Nomansland Farm and Nomansland common, so already you've helped! The birth certificate just lists Nomansland, so is it possible there were houses etc. there, or is it more likely do you think that he was born on Nomansland Farm? (the family were farmers in Chelsham). Any advice or suggestions that you might be able to provide would be enormously appreciated, Thanks for your time.